This log cabin has a spectacular view of the mountain ranges and the valley below! There is sleeping for six in two queen bedrooms and a fold out sofa in the loft area. There are two and one half baths plus a covered wraparound porch which you will never want to leave. Hot tub, pool table, and satellite TV in each bedroom and Great Room with DVD player, washer and dryer, gas grill, and gas fireplace for cool mountain evenings make this a favorite!. Come for the view and let us take care of the details. There is a garage and the roads are paved so both are great for bikes! I have a total of 5 cabins on VRBO; Bear, Deer, Angler And Cowboy as well. Please look at the reviews on these for more information. Great hot tub on the Deck to watch the sunrise. Couldn't have asked for more! Spacious cabin with all that we needed. Neighbors are nice with super friendly dogs to play with ours! We didn't have cell service on TMobile but did with Verizon. Gorgeous view from the deck for sunrise and from outback for the sun set. Thanks for allowing us to stay!! Stayed here on a motorcycling trip with my dad and a couple of friends. The view is amazing. The kitchen is well-equipped. There are three bathrooms, a nice big garage, a charcoal grill, nice TVs and decent wifi (surprisingly good for the remote location). The private road leading to the property is steep and twisty, but paved and well-maintained. Doug is a responsive communicator and excellent host. Relaxing retreat away from it all! Cabin was spacious with a wonderful private deck and view of the mountains. We didn't want to leave! We brought all our own groceries from home because there's not a lot nearby, at least that we saw, which was fine by us. Great view of the stars (and the Milky Way!) at night from the deck. We would definitely stay again. The perfect get away for a family that lives in a small city. My brother and I grew up a little in theses parts when we were young teens. It was awesome that we could bring our families back to see some of their heritage! Doug is very kind and professional to work with, his hospitality goes hand and hand with the people of Tennessee! The only knock I would have, is that the pictures on the site will never be able to do the justice as to what you see from the Mountain High cabin. Safe to say that we will be back every year in the same cabin as long as they are available to rent. We enjoyed our time of good ole fashioned fun and relaxation. The view overlooking the mountains and valley was good for the soul! This cabin was exactly what we expected when we arrived. Some of the things that we loved about it were; the porch overlooking the mountains (partly covered and partly not so even when it rained you were sheltered and yet when sitting in the hot tub you had full view of the stars and the bonus for our dog - it was fenced all around), the peace and quiet (such a difference from the Pigeon Forge area where it's congested), friendly neighbours, true cabin "feel", cleanliness (which is often lacking in a pet-friendly accommodation) and plenty of outdoor sights to visit (super close to the Cherohala Skyway drive and fun to watch the kayakers on the rapids of Tellico River at Bald River Falls). Doug was great, helpful as necessary but also respectful of our family time and privacy. 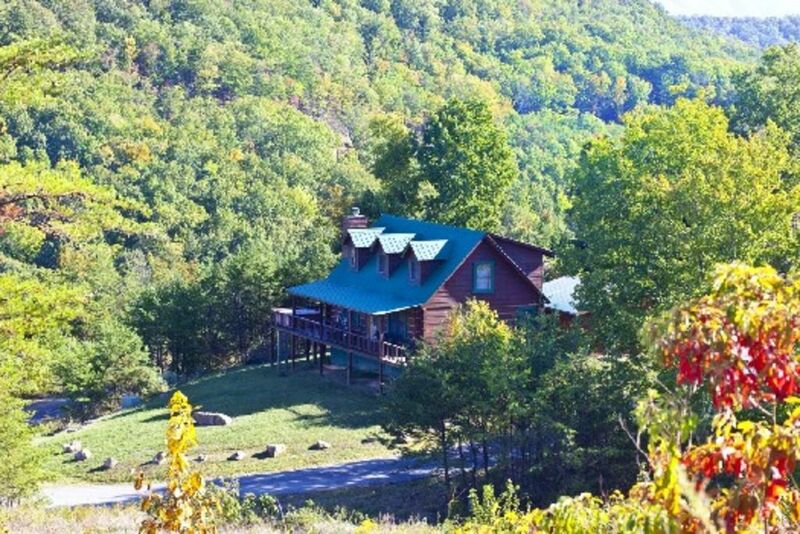 This cabin met our needs perfectly... we brought our teenage children and pooch and just wanted to spend time together relaxing and resting. And that's what we got. Great to meet you guys! Please come back.